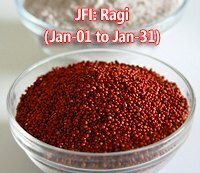 For this month’s JFI Ragi or Finger Millet has been chosen. Ragi is an extremely nutritional grain with high iron content. Finger millet is especially valuable as it contains the amino acid methionine, which is lacking in the diets of hundreds of millions of the poor who live on starchy staples such as cassava, plantain, polished rice, maize meal. It is very popularly used in South India. Here, in North India people are not much aware about this. If cooked in a proper way it can be extremely tasty. Do not go by the colour of the finished product is what I will suggest…. At my place we all love ragi and do enjoy it’s health benefits. I make a variety of dishes using this wonderful grain and I am eagerly waiting for the round up to try more..
Today I am posting Ukarpendi. Ukarpendi is a Marathi term and is used for Upma’s made with flour by the process of steam cooking which we call Ukad in Marathi. This particular Ukarpendi can be made completely with ragi flour also but addition of wheat flour adds in more flavour. Ragi is a very bland grain and needs to be overly spiced to taste better, adding wheat removes the blandness and yields a better textured Ukarpendi. The Ukarpendi is filling and is an extremely good option for breakfast or a lunch box item. Some precautions that one must take while making this dish are…roast the flours on low flame till they produce a nice aroma. This dish needs oil in a little extra quantity, else it turns out very dry and becomes very difficult to eat. The spices need to added more liberally to bring in the flavours..
Roast the flours and keep them aside. Heat oil and add mustard seeds, asafetida followed by urad-chana dal and green chilies. Once the onions are done add turmeric, red chili, coriander, cumin pwds and salt to taste. Now add the flours and roast it for a few mins in the oil. Mix in the curds and sugar. The curds adds a mild sour taste. Now comes the tricky part. Add boiling water gradually and keep mixing. This process has to be done very fast ensuring no lumps are formed. Add water till the flour absorbs water and comes to a state of slightly loose dough. Cover the pan and steam cook for about 5 minutes. Serve hot with a dash of ghee on top and garnish with fresh coconut and chopped cilantro. Sending this to Hosted by Madhuram and is the brainchild of Indira of Mahanandi. The name of the dish was completely new. Seeing the recipe, I think this is similar to the morkali recipe of Tamil. We make it without onion or any other veggies. The addition of the same surely makes it more delicious. Very new to me, looks delicious, almost like Upma with ragi. Healthy dish! It's similar to morkali! completely new to me...looks so yummy! the name itself is very new to me, Pari !!! sure this is delicious !! Another healthy dish. I've been looking for wheat flour for my cookies.. Awesome nutritious dish, completely new to me.. This is something very new to me, lovely! Unique recipe..When I read the name I thought it is fried..:D , don't know why..This sounds delicious and healthy, Pari !! Dear Jayasree and Nandini, would love to read Morkali recipe from either of u.
Ashaji, it's quite like an Upma. Preeti, Aaji's surely make the best food right!!! Dear DH MK thanks for appreciating the food I cook, that means a lot to me. Ancoo, looking forward to ur wheat cookies. Spice, will check out ur post, I am glad u liked it. Thank you friends for appreciating the preparation. I am glad I could contribute something that u find new. wow, this looks really good..looks like maharshtrain mokal bhajani..love the click. New and delicious recipe with ragi ! The name is so nice and new... Looks very blissful... Should be very healthy and I havent tried it myself am bookmarking it!!! new to me! so healthy n interesting..
nice entry for the event.. Thanks for sharing this Pari. have brought some ragi this month. will try it surely. very intersting and new recipe.we make a similar kind using rice/wheat flour. New to me, seems healthy and yummy.... bookmarked it. Hi Ashwini welcome to my blog. I am so glad that you enjoyed reading my space. Keep visiting dear. Sayantani, great now that you have ragi, please go ahead and try this. PJ, Rujuta, traditionally this is made with wheat flour, using nachani was my innovation to add more ragi in our diet. Suneetha, U can take more proportion of wheat and less of Ragi if you are not so fond of it. But I will still request try my version, hopefully you will like it. Deepa, it surely has a texture that resembles to mokali bhajani. I am so glad that my friends have liked my recipe, your encouragement motivates me to try more. Looks and sounds good,a healthy wholesome meal! New to me .Sounds delicious and interesting! Pari that's such a new dish to me. I'm definitely trying this recipe ASAP. How much water is required approximately?